A favorites folders for your favorite streamers at the top of your following list but also separate ones that you can customize. Favorite partners, favorite games so that your favorite streamers show up in your folder at the top. That would be my FAVORITE feature of Mixer. Disabled Streams and Partnership Applicaiton Support! Applying for Partnership can be difficult for anyone, but especially for people with Disabilities, and it was brought to my attention after being denied, that their is no longer an option to appeal a Partnership Denial. As a 100% Disabled Veteran with PTSD, and Major Depression Disorder, and on top of that Autism Spectrum Disorder, and Generalized Anxiety Disorder, not being able to communicate with someone after the initial application is denied, can be very difficult and frustrating, and not saying all disabled applicants should be approved, but I think they should maybe get some special attention, the process and possible denial can be extremely stressful and frustrating for anyone but especially more so with people with similar disabilities to mine. Despite my Disabilities I am an excellent streamer, with a great community, and streaming is a great way for me and others with disabilities to communicate with the world and meet new friends, in ways that we can not do in real life. With that said, I know several streamer like me with Autism, and I think the process for Partnership is in a way cruel to some of us with this disability, as not being able to communicate with a staff member during the process, or even appeal a decision, or get special consideration, is especially hard, and for me personally just submitting the application had my Anxiety at an all time high, and the depression at an all time low after the denial. The worst part was on my first application being denied for something (No Graphics in my Profile) which was not even the case, I had added graphics hours after submitting my application, but I had no way to communicate back to staff. I do not want to make this only about me, but I know many streamers with disabilities that struggle with the inpersonal application process and their is room for improvement for Mixer to better embrace and support the disabled streaming community! I have poor vision. Difficulty discerning small fonts. Difficulty picking out contrasts between similar colors. 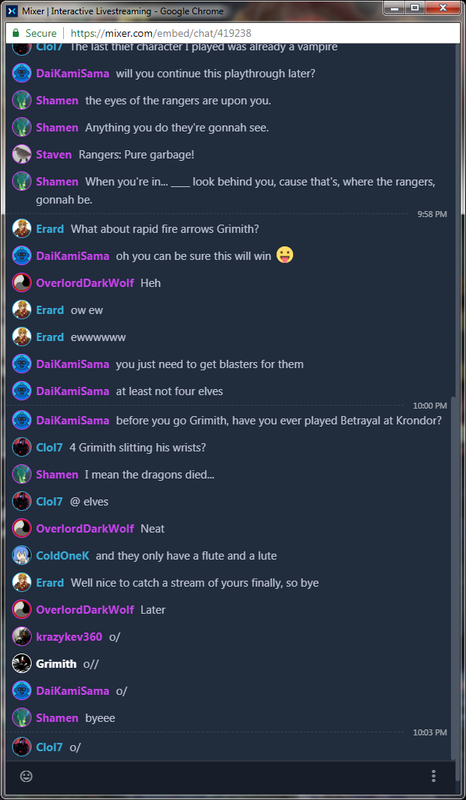 Mixer's new UI brings me discomfort because I have trouble picking out what's written in chat windows from the chat's background. This is an accessibility issue that inhibits my use of Mixer. I'm forced to modify my browser output using DevTools to create a starker contrast between chat font color and chat background (relatedly, I use those same tools to increase Mixer chat's font size). Without those DevTools, I'd stop visiting this site altogether since I'd lose chat interactivity. 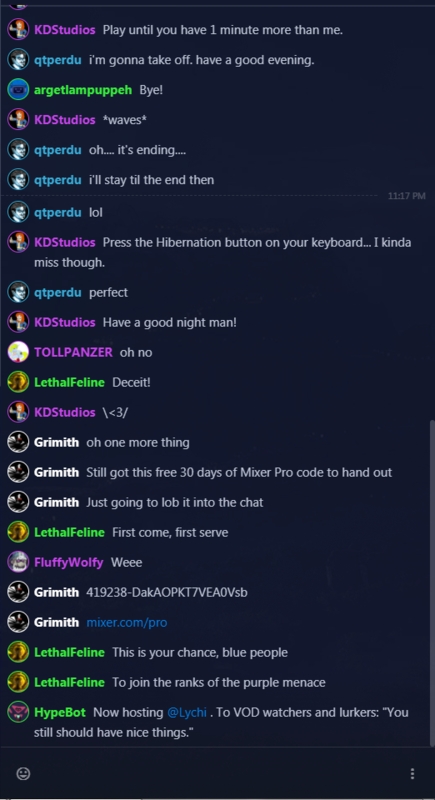 Now, Mixer does have a built-in way for changing a chat's background: The Chroma Key Toggle. This function completely resolves my contrast issue (which I care more about than the chroma key effect itself). However, said function only works for my own chat - even though it only alters my perspective. If Staff would modify the chroma key toggle to work globally for a viewer, then this feedback would be satisfied. Of course, there are more intricate changes I'd find more convenient, but modifying the chroma key would create the starkest change in the least amount of time. As of right now attaining partner status can be very difficult for those with disabilities. It would be ideal to allow an affiliate program that anyone can apply to and extremely helpful for those with disabilities who want to attain a status within the Mixer community. For example someone with Narcolepsy such as myself may not be able to stream 25+ hours a month, or have the energy to maintain a large fanbase of 2k followers. As of right now Twitch is more inclusive for those with disabilities because their affiliate program with minimum requirements of about 500 minutes streamed a month, 3 concurrent viewers over a 30 day period and a minimum of 50 followers. Let's make Mixer a more accessible place for those with disabilities and not shut the door on opportunities that would enable those to succeed. Microsoft is a very open diverse environment that is friendly to those with disabilities and I would like to see this culture carried over into Mixer through an Affiliate program. Hi I'm a mixer steamer by the name of Skape. For a long while now I've seen allot of new streamers (as in created the account the day of) being featured on the up and coming section of the dashboard. Obviously over the moon with this they think right this is for me! I have X amount of viewers on my first stream (which we all know it doesn't work like that) so the next day rolls around and they stream again... Dead air so they give up thinking they are doing something wrong, I have seen talented people do this first hand. Now I'm not saying get rid of it I'm suggesting adding requirements such as a month old account minimum, with X amount of streams, this way the people who end up being featured will understand how views and interaction will peak and dip and so can deal with it. I feel this will give boosts to the content creators whom need a little push but have the dedication and know how to keep going when it might fall! Maybe create a Toggle option to allow raids to happen or not. Some people don't like the pressure that comes with it. Why can we not adjust our own video quality? If i have multiple streams going maybe I don't always want others in 1080 and want to lower the quality. Also lost the ability to choose audio only. I think the sparks system could use an overhaul. I saw a good first step in Season 2 but i think that only benefits partners and not the smaller streamers or viewers. if I change games in the middle of the stream, i would like to change the Title of the Stream, instead I am forced to end the stream in order to change the Title. On Xbox. Lets make Mixer more unique and accessible for all who likes to game. I suggest to add automatic subtitles generation for streamer speech so deaf people can interact with a streamer. 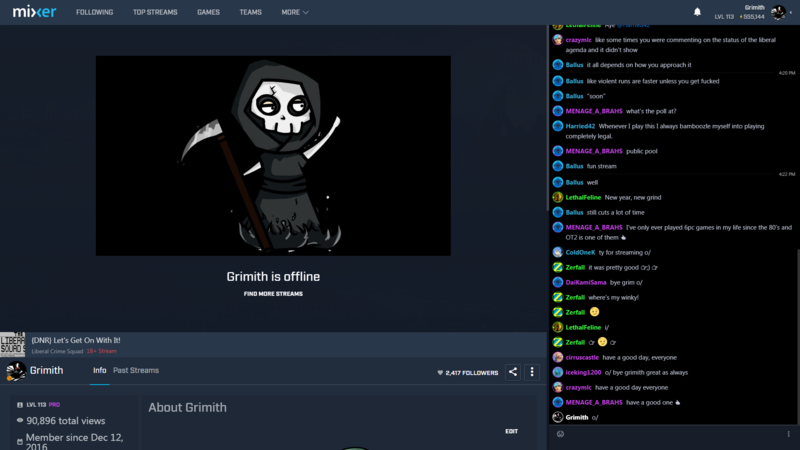 I was about to try out Mixer, I am currently streaming for over 1 year and 6 months on Twitch... But your guys acessibility (login etc) is soooo bad.... like most of Windows products the BIG Burocracy in the Login section is so lame that I kinda gave up on trying... Thanks tho, just thought about giving you guys the feedback as a final user/client.. I couldnt log, somehow i made myself and automatic Xbox Live account that I didn't even ask for... Tried to put my e-mail to login, it accepted and than when I clicked in having trouble to log, I put my e-mail you guys are suppose to send me an e-mail to update the info etc... Ih... its just bad. Maybe should be a good idea to add lower resolution options like 240p or 160p on live streams and vods. Hello guys, my name is Spartan and I live in Brazil, I would suggest in the part of the PRO signature, put the value in the currency of each country, I do not know if this would be easy and viable, but I find it interesting, since some people can confuse value with the currency of the country that lives and the value on the credit card for example, be totally different from the visa, but not that this is a problem in fact, since the value appears correctly there in American currency. I think it would be nice to be able to open another app on my phone and still be able to view the stream through a little moveable side panel. It would allow me to do other things while still being able to stay connected to the stream and continue to participate. It would be similar to what YouTube does with YouTube Red subscriptions or what Twitch does. When clicking on an emote in another stream it should redirect you or indicate which channel the emote comes from. Many times I find that I would like to know which channel an emote comes from. it would be nice if the chat was a different color from the background. links, whispers,names and such are the same shades of blue. i am color-blind and have a very hard time distinguishing the differences between all. and then they are on a blue background. Its just all very hard to see.